The first public build of Visual Lint 7.0 has just been uploaded to our website. As of today, Visual Lint 7.0 replaces Visual Lint 6.5 as the current supported Visual Lint version. Customers with active Visual Lint 6.x priority support, floating and site licence subscriptions should shortly receive updated licence keys for the new version, and upgrades for Visual Lint 5.x and 6.x per user licences will become available in our online store soon. Older editions can be upgraded manually - please contact us for details. In addition, most customers who have purchased per-user Visual Lint licences since the start of January will shortly receive new Visual Lint 7.x compatible licence keys. Replaced Visual Lint Standard Edition with Visual Lint Personal Edition. Note: Visual Lint Personal Edition is licenced for use by individual and freelance developers rather than organisations. If your organisation has more than one member of staff, you must use Visual Lint Professional Edition or above. As such organisations which have purchased Standard Edition licences in the past must upgrade them to Visual Lint 7.x Professional Edition or above if they wish to use Visual Lint 7.x. See Visual Lint Product Editions for details of the available product editions. Added support for Microsoft Visual Studio 2019 to the Visual Studio plug-in. VisualLintGui and VisualLintConsole have also been updated to support Visual Studio 2019 solution and project files. Note: Support for the v142 toolset is not yet complete so you may (for example) find that you need to add details of the Visual Studio 2019 system include folders to your PC-lint Plus std.lnt file in order that your analysis tool can locate system include files. Removed support for Windows XP, Windows Vista and Windows Server 2003 (although the software should still function on these platforms, we no longer test on them). PC-lint Plus is now recognised as a distinct analysis tool from PC-lint 8.0/9.0. As a result it is now straightforward to switch between the two products. Added PC-lint Plus specific compiler indirect file co-rb-vs2019.lnt for Visual Studio 2019. The environment variable _RB_PLATFORM on the generated PC-lint Plus command line now includes the string name of the platform rather than an enumerated value. Added the environment variable _RB_TOOLCHAIN to the generated PC-lint Plus command line. This is used to determine which compiler indirect file to use in Atmel Studio projects where the AVR platform (which can be either 8 bit or 32 bit) is used. In such cases the toolchain (e.g. 'com.Atmel.AVRGCC32') is unambiguous and can be used instead. Added a PC-lint Plus indirect file (co-rb-as7.lnt) for Atmel Studio 7.x to the installer. This conditionally invokes compiler indirect files for either ARM (32 bit), AVR (8 bit) or AVR (32 bit) compilers based upon the active platform and toolchain. Added additional PC-lint Plus suppression directives to the indirect file lib-rb-win32.lnt supplied within the installer. The installer will now ask you to close third party development environments (devenv.exe, atmelstudio.exe, eclipse.exe etc.) before installation can continue only if the corresponding plugin is selected for installation. Removed the PC-lint 8.0 message database. If it has not yet been configured, Visual Lint no longer prompts to run the Configuration Wizard when it is started. Instead, the user is prompted only when they attempt to start manual or background analysis. When a Visual Studio solution is loaded, the version reported is now that corresponding to the highest version of platform toolset in the solution. e.g. If a Visual Studio 2019 project contains Visual Studio 2015 and 2017 projects, the solution will be reported as being for Visual Studio 2017 for analysis purposes. The elapsed time in the Manual Analysis Dialog is now displayed in minutes and seconds rather than just seconds. Increased the size of the "Active Analysis Tool" and "Options" dialogs. The Message Lookup View can now switch dynamically between message databases for PC-lint and PC-lint Plus. Revised Configuration Wizard page text to differentiate between PC-lint and PC-lint Plus where appropriate. "Project" nodes in the VisualLintGui Projects Display now include details of the active configuration and project type in the same way as the root "Solution" node. The Analysis Status, Statistics, History and Results Displays now indicate the name of the active analysis tool. Fixed a potential crash in the Analysis Results Display. Fixed a bug which prevented PC-lint Plus analysis from being run on an IncrediBuild grid. Fixed a couple of bugs in the Configuration Wizard which affected PC-lint Plus. Fixed a bug in some of the displays which could cause one of the columns to be oversized. PC-lint Plus user defined messages (8000-8999) are now correctly categorised as informational. Fixed a bug which could cause PC-lint Plus command lines containing the obsolete PC-lint +linebuf or +macrobuf directives to be generated if the analysis tool was set to PC-lint but the analysis tool installation folder was overridden to point to a PC-lint Plus installation folder. If you are reading this you might have noticed that the Riverblade website has undergone a bit of a redesign. This is something we've been working on for a little while in the background, and we think it's probably now at least good enough to let loose on the world. We hope that you find the new responsive website to be an improvement on the old one. Template aside, the design and implementation was done in-house, so it's entirely our own work and therefore any bug/content fixes should be relatively quick (as an aside, we did contract out a redesign a while back, but we never released it because we weren't happy with the design the external consultancy produced). Along with the new design, we've also moved most of the content to a new domain (riverblade.co). We've tried to make all of the redirects automatic, but needless to say if you discover any broken links, typos etc. please do let us know. (and in case you are wondering: we have indeed been known to celebrate finishing a project with Prosecco and fish and chips). 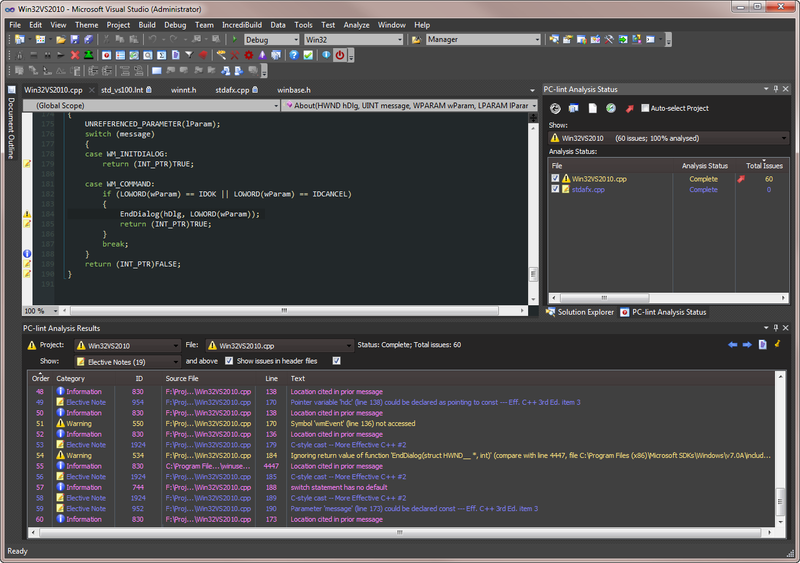 Added support for Texas Instruments Code Composer Studio 7.x and 8.x. 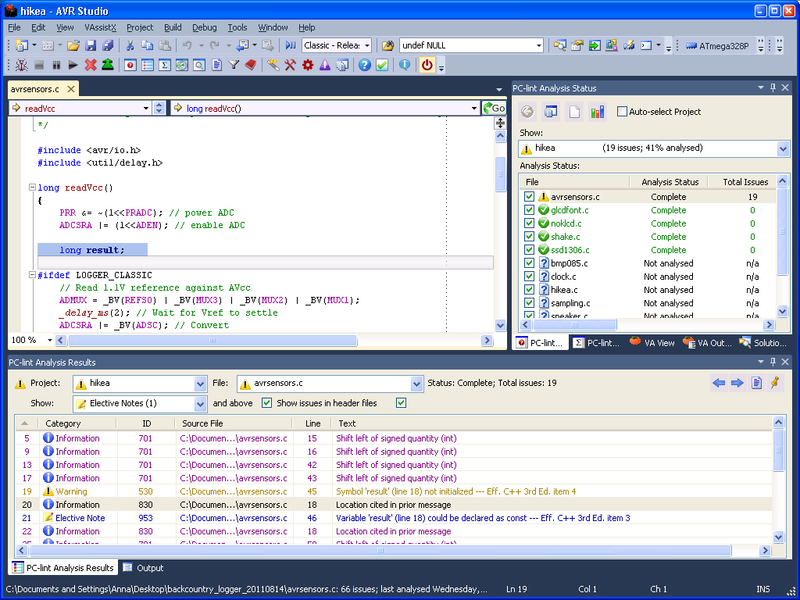 Note that when a project for CCS 6.x or later is opened, the latest installed version of the IDE will be assumed. Fixed a bug in the parsing of Texas Instruments Code Composer 5.x/6.x/7.x/8.x projects which could cause them to be inconsistently classified as vanilla Eclipse projects in some circumstances. Fixed a crash which could occur in VisualLintGui if saved PC-lint or PC-lint Plus issue category data became corrupted. The generated PC-lint/PC-lint Plus command line now includes a -width(0) directive at the beginning. This ensures that any fatal errors are reported on a single line. Added a PC-lint Plus indirect file (co-rb-gcc.lnt) for GCC to the installer. Added a PC-lint Plus indirect file (co-rb-ti-arm.lnt) for the Texas Instruments ARM compiler to the installer. Added details of the /silent and /verbose switches to the VisualLintConsole help screen and documentation. Modified generated Vera++ command lines to replace the -showrules option with --show-rule. In consequence the minimum supported version of Vera++ is now 1.2.1. When a Visual Studio 2017 project using the /Zc:alignedNew or /Zc:alignedNew+ option is loaded the C++ 17 __STDCPP_DEFAULT_NEW_ALIGNMENT__ preprocessor symbol will now be included in the generated analysis configuration. Corrected the value of _MSC_FULL_VER referenced in the PC-lint Plus compiler indirect files for Visual Studio .NET 2002 and 2003 (co-rb-vs2002.lnt and co-rb-vs2003.lnt respectively). Gimpel Software (the vendor behind PC-lint and PC-lint Plus) have recently updated their website, and it is now dedicated entirely to PC-lint Plus. If you are considering upgrading from PC-lint 9.0 to PC-lint Plus, the relevant information is available at PC-lint Plus for PC-lint/FlexeLint users. At the moment the demonstrator only includes compiler configurations for Visual Studio 2013 and 2015, but please don't let that put you off as it can work with most compilers including those based on GCC. How long will PC-lint/FlexeLint Version 9 be supported? PC-lint/FlexeLint Version 9 are no longer being maintained. The final update was Version 9.00L, released in 2014. Technical support will be provided for these products through the end of 2018. That being the case, we intend to remove PC-lint 9.0 from our online store shortly. Gimpel are selling PC-lint Plus licences directly rather than via resellers, so if you need a quote for a PC-lint Plus licence please contact sales@gimpel.com for details or use the links below. Fixed an MSBuild parsing bug which was preventing Visual Studio system include folders from being read in some circumstances. Fixed a bug which could prevent the VisualLintGui code editor determining the location of PC-lint Plus indirect files in order to open them from a context menu. Updated the values of _MSC_VER and _MSC_FULL_VER in the PC-lint Plus indirect file co-rb-vs2017.lnt for compatibility with Visual Studio 2017 v15.8.3. This change is needed to fix a fatal error in yvals_core.h if _MSC_VER is less than 1915. Added a PC-lint Plus compatible version of lib-stl.lnt to the installer as it is not currently supplied with PC-lint Plus. Added additional indirect files needed for analysing Visual Studio 2012, 2013 and 2015 codebases with PC-lint Plus 1.2 to the installer. If a project intermediate files folder does not currently exist, it will not be referenced with a -i (include folder) directive on generated PC-lint or PC-lint Plus command lines. This avoids extraneous 686 warnings "(Warning -- option '-i<folder path>' is suspicious: absolute path is not accessible)". Note that if build artifacts (e.g. .tlh or .tli files) are required for analysis purposes, analysing without the intermediate folder will most likely result in analysis errors. In this case, performing a build and re-analysing the affected files/projects should fix it. LintProject Pro is a command line only product which can perform a basic per-file analysis of a C/C++ codebase using PC-lint or CppCheck. In many ways it was the proof of concept for Visual Lint, and although it has served us well, it's getting a bit long in the tooth now. For example, unlike Visual Lint Build Server Edition (which has inherited its capabilities), LintProject Pro only makes use of a single CPU core when running analysis and doesn't support current analysis tools such as PC-lint Plus. The interfaces to the two products are however very similar as the command line interface of Visual Lint Build Server is based on that of LintProject Pro. In fact, Visual Lint Build Server Edition can do everything LintProject Pro can - along with much, much more. As such we think it is now finally time to put LintProject Pro out to pasture, and to make that easier we are offering a migration path from LintProject Pro to Visual Lint Build Server Edition. This involves trading in each existing LintProject Pro licence purchased before 23rd October 2018 for a 25% discount on a corresponding Visual Lint Build Server Edition licence. As such LintProject Pro has now been removed from our online store. To take advantage of the upgrade, just write to us quoting which LintProject Pro licence (or licences) you wish to trade-in. We've tried to keep this process clear and simple. The value of the discount offered exceeds that of the LintProject Pro licence, so this is a lower cost route to obtain an equivalent PC-lint Plus compatible product than (for example) refunding any existing LintProject Pro licences and purchasing Visual Lint Build Server Edition licences at full price. If a "Lint" folder without the hidden attribute exists in a solution/workspace folder Visual Lint will no longer attempt to use it to store analysis results and will create a new ".visuallint" folder instead. This prevents Visual Lint from assuming that a user-created "Lint" folder is one which was created by an earlier (pre-v5.0) version of Visual Lint. Fixed a crash which could occur when files were saved in the Eclipse plug-in. The crash seemed to particularly affect plug-in installations running within Texas Instruments Code Composer Studio and configured for per-project analysis with the "Re-analyse saved files using the preferred method" option set. The project variables $(CEVER), $(ARCHFAM) and $(_ARCHFAM_) are now automatically defined when analysing Visual Studio 2008 projects for the NetDCU9 (ARMV4I) platform. Corrected the "Supported development environments" help topic to reflect the fact that Atmel AVR Studio 5 and Atmel Studio 6.x/7.x are now supported via a dedicated plug-in. Updated the PC-lint Plus message database to reflect changes in PC-lint Plus 1.2. Note that the definitions for Clang errors 5905, 5916 and 5922 have been omitted as the PC-lint Plus -dump_messages directive does not reveal either their titles or descriptions. Added the ability to override the analysis tool installation folder on a per solution/workspace or project basis [Visual Lint Enterprise and Build Server Editions]. The analysis tool executable pathname can now be overridden on a per project basis as well as per solution/workspace [Visual Lint Enterprise and Build Server Editions]. Fixed a minor resizing bug in the Analysis Configuration Dialog. Fixed a minor bug in the "Active Analysis Tool" dialog. Added basic support for Qt Creator projects (.pro/.pro.user files). Note that the implementation does not yet support subprojects or read preprocessor and include folder properties. As such, if the analysis tool you are using requires preprocessor or include folders to be defined (as PC-lint and PC-lint Plus do) for the time being they must be defined manually (e.g. written as -D and -i directives within a PC-lint/PC-lint Plus std.lnt indirect file). The "Analysis Tool" Options page now recognises PC-lint Plus installations containing only a 64 bit executable if the "Use a 64 bit version of PC-lint if available" option is set. When the PC-lint Plus installation folder is selected in the "Analysis Tool" Options page the PC-lint Plus manual (<installation folder>/doc/manual.pdf) is now correctly configured. Added a workaround to the Eclipse plug-in for an issue identified with some Code Composer Studio installations which source plug-in startup and shutdown events in different threads. Fixed a crash which affected some machines when the "Analysis Tool" Options page was activated when PC-lint was the active analysis tool. Fixed a bug which caused the Visual Studio plug-in to be incorrrectly configured in Visual Studio 2017 v15.7. Fixed a bug which could cause the PC-lint/PC-lint Plus environment file to reset to "Defined in std.lnt". Updated the "Example PC-lint/PC-lint Plus project.lnt file" help topic and those relating to supported project types. We had an absolute blast at this year's ACCU Conference, and if you were there we imagine you did too. For us the highlight had to be the launch of #include <C++>, a new global, inclusive, and diverse community for developers interested in C++. This is an initiative that has been brewing for a while, and we're very happy to be a part of. Above all else #include <C++> is designed to be a safe place for developers irrespective of their background, ethnicity, gender identity or sexuality. The group runs a Discord server which is moderated to ensure that it remains a safe space and which you are welcome to join. On the technical front, one unexpected highlight of the conference was Benjamin Missel's wonderful short talk on writing a C compiler for a BBC Micro, during which he demonstrated SSHing into a BBC Model B through the serial port! Most conference sessions were recorded so even if you weren't there you can still watch them. See you at ACCU 2019! ResOrg 2.0.7.27 has just been released. This is a maintenance update for ResOrg 2.0, and is compatible with all ResOrg 2.0 licence keys. Fixed a bug in the Symbols Display which could cause some "OK" symbols to be incorrectly shown in the "Problem Symbols Only" view. Corrected the upper range limit for control symbols from 28671 (0x6FFF) to 57343 (0xDFFF). ResOrg binaries are now dual signed with both SHA1 and SHA256. Corrected the File Save Dialog filters used by the ResOrgApp "File | Export" command. The ResOrgApp "File | Export", "File | Save", "File | Save As" and "File | Properties" commands (which apply only to symbol file views) are now disabled when the active view is a report. Fixed a crash in the Symbol File Properties Dialog. Fixed a typo on the Symbol File "Next Values" page. Various minor improvements to the installer. Visual Lint 6.5.1.294 has just been released. This is a maintenance update for Visual Lint 6.5, and is compatible with all Visual Lint 6.0 and 6.5 licence keys. 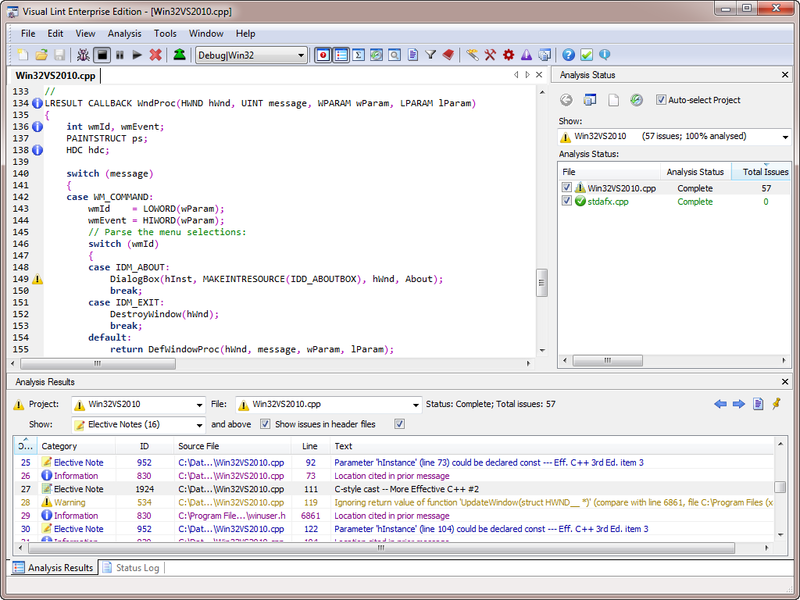 Built-in compiler preprocessor symbols are now automatically included in the analysis configuration for Atmel Studio projects using ARM toolchains where possible. Fixed a bug which caused a "project changed" event to be erroneously sourced if an external project file located in the same folder as a loaded project was changed. The PC-lint raw analysis results parser will now raise a fatal error if a PC-lint Plus License Error is detected. Fixed a bug in the "Analysis Tool" Options page which affected browsing for an analysis tool installation folder. Modified a handful of prompts to refer to "PC-lint or PC-lint Plus" rather than just "PC-lint". The first public build of Visual Lint 6.5 has just been uploaded to our website. Visual Lint 6.5 is the second Visual Lint 6.x release, superseding Visual Lint 6.0. As a minor update, it will also accept existing per-user Visual Lint 6.0 licences; Visual Lint 1.x, 2.x, 3.x, 4.x and 5.x per-user licences must however be upgraded to work with this version. Removed the (deprecated since Visual Lint 5.0) ability of the Visual Studio plug-in to load within Microsoft Visual Studio 6.0 and eMbedded Visual C++ 4.0. Projects for these environments can of course still be analysed in the standalone VisualLintGui and VisualLintConsole applications. Modifications to support PC-lint Plus PCH analysis, which creates object files (.lpph or .lpch) in the project working folder rather than (as was the case with PC-lint 9.0) in the folder containing the PCH header file. This should affect only projects where the PCH header file is contained in a different folder from the project file. PC-lint project indirect (project.lnt) files are now automatically recreated if a different version of the analysis tool is in use. The installer now prompts for affected applications (Visual Studio, Atmel Studio, AVR Studio, Eclipse, VisualLintConsole and VisualLintGui) to be closed before installation can proceed. The installer now installs VSIX extensions to Visual Studio 2017 and Atmel [AVR] Studio silently. Revised the order of registration of the Visual Studio plug-in with each version of Visual Studio so that the newest versions are now registered first. Uninstallation no longer incorrectly runs "Configuring Visual Studio..." steps if the VS plug-in is not selected for installation. The "Installing Visual Lint" progress bar is now updated while Visual Studio, Atmel Studio and Eclipse installations are being registered. Improved the logging of VSIX extension installation/uninstallation. The Analysis Status View now supports text filters of the form "Project/File". Added a new Window List Dialog to VisualLintGui to display details of the open MDI child windows, and allow selected windows to be activated, saved or closed as a group. Widened the About Box slightly. Replaced the table sort code in generated HTML reports with a simpler, more robust implementation from https://www.kryogenix.org/code/browser/sorttable/. Converted links to HTTPS where possible. Fixed minor bugs in the Property List Dialog. Added a workaround for a race condition in boost::filesystem::path which could cause one or more projects to fail to load or even a crash. See https://svn.boost.org/trac10/ticket/6320 for details. 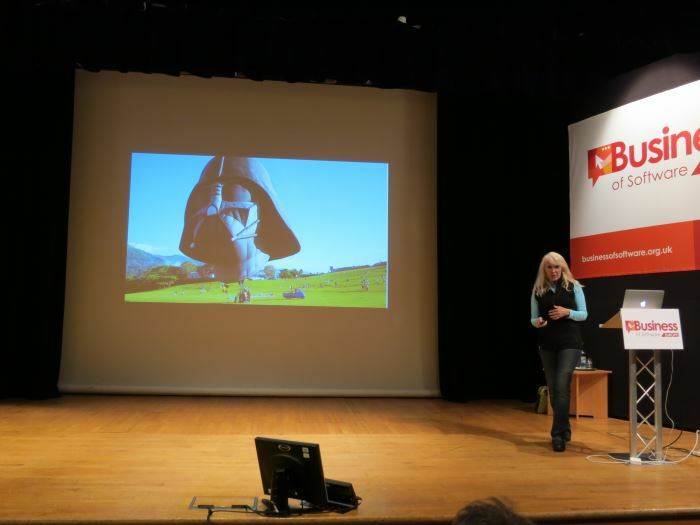 Our founder Anna attended the Business of Software Europe Conference in Cambridge last week, and it was quite something indeed. 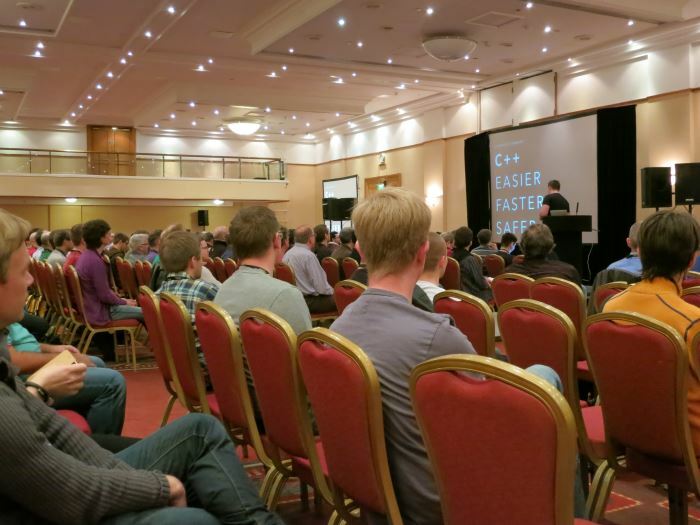 Although the Business of Software Conference has been running for several years in the USA, this is the first year an event has been held in Europe (and what better a place than Cambridge?). The conference covered everything from live Python telephony to the psychology of the internet and the organisation and management of sales teams, so it was pretty diverse. If you are interested in more than just coding, this is an event we can strongly recommend. Photos and videos from the conference should be online soon, so if you are interested please stay tuned. We have recently been working with Don Burn on PC-lint analysis of Windows Driver Kit (WDK) projects, and he has written an interesting article on the subject titled "Another Look at Lint" in the March-April 2013 issue of the NT Insider. Finally the ultimate tool for using PC-lint with the WDK is Riverblade's Visual Lint. 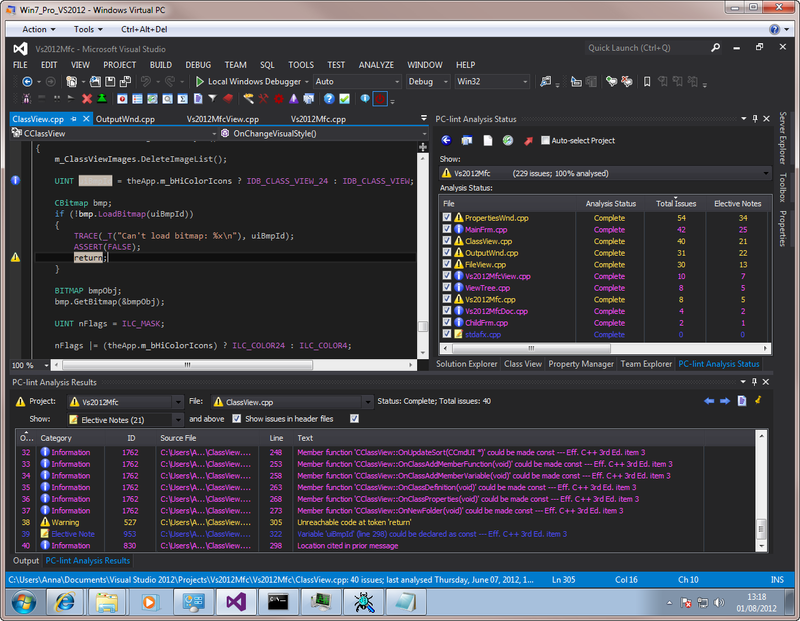 This is a third party tool providing an integrated package that works inside VS2012. The tool is an add-on to PC-lint which you must still purchase. The capabilities include background analysis of the project, coded display listings that - like Visual Studio - clicking on the error takes you to the line to edit and provides easy lookup of the description of the errors. The latest version of Visual Lint (4.0.2.198) is required for use with the WDK. The tool has a minor bug that if there are two subprojects with the same name, such as filter in the Toaster sample, one needs to be renamed for analysis to work. A fix is in the works. To use Visual Lint with the WDK choose LintLdx.lnt as the standard lint configuration file for the tool. There is a 30-day free trial of Visual Lint available so if you are considering PC-lint, take a look at what Visual Lint can add to the experience. I expect to be using it for much of my work. Our thanks to Don Burn for his patience while we worked through the issues raised by the analysis of WDK projects. As a postscript, a fix for the bug he refers to above has already been checked in and should become available in the next public Visual Lint build (most likely 4.0.3.200). One of the unexpected (and I would suggest from the comments, unwelcome) changes sprung on developers in the Visual Studio 2012 Beta back in February was the Metroification of the development environment. However, eye candy (and eyesores!) come and go, and within that change is a more fundamental one - direct support for themes within the Visual Studio IDE. 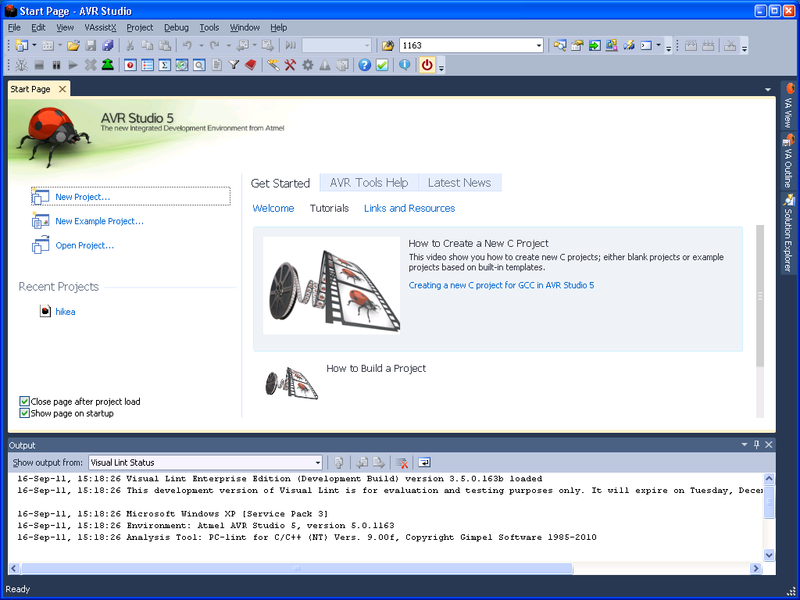 The Visual Studio 2012 Beta and RC include two themes - light (i.e. grey) and dark. Whilst the latter has an obvious appeal within the developer community (we all know devs who prefer green text on a black background) the former hasn't exactly been welcomed, to say the least. 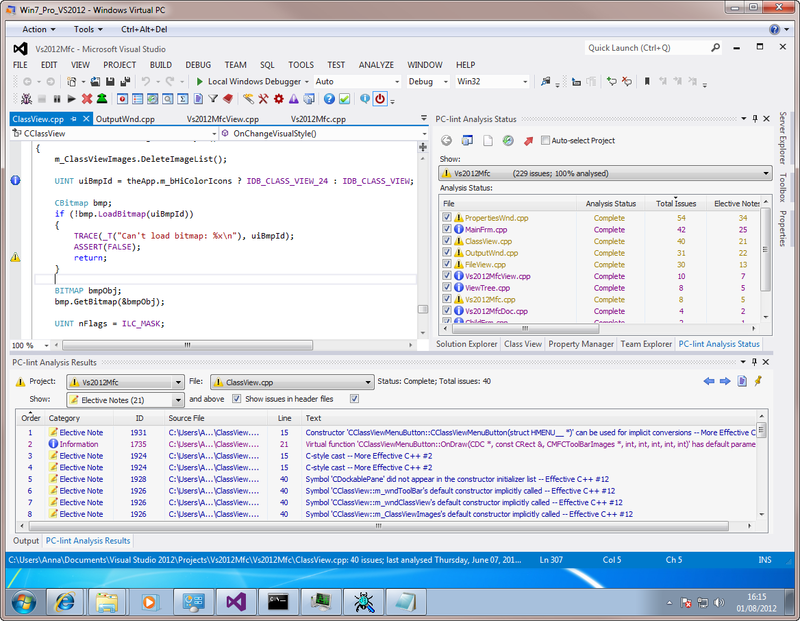 Although a campaign to retain the existing Visual Studio 2010 theme has been running on the UserVoice site since the beta arrived (see Add some color to Visual Studio 11 and Leave VS 2010 theme (and the theme editor extension) as an option) Microsoft have not indicated what - if any - changes will be made to the Visual Studio 2012 themes at RTM. Our working assumption therefore has to be that the themes in the RTM will be broadly comparable with those in the RC (i.e. light and dark). We will find out whether that assumption is correct later this month, of course. As Visual Lint uses standard Win32 controls for most of the UI (which for the most part do not support custom text/background colours), to get this far we have had to write custom painted WTL checkbox, radio button, combobox and header controls in addition to the usual WM_CTLCOLORxxxx voodoo. Other UI elements such as menus, scrollbars, command buttons etc. yet haven't yet been looked at, but hopefully will be in due course (there seems to be some indication in the MSDN blogs that scollbars will be auto-themed by the RTM, but we'll see). Within the displays themselves, the text and background colours of each item are checked for adequate contrast, and the text colour adjusted (by tweaking the luminance) automatically if need be. Although the Visual Studio interfaces expose the colours used in the active theme (via IVsUIShell2::GetVSSysColorEx() ), they do not seem to provide any way of detecting if the theme has changed (or indeed, finding out which theme is actually running at the time). Our workaround for this is simply to reload the colour scheme whenever the "Tools|Options" command has been executed. We don't really care which theme is running after all - just what colour values it uses, and where. Indeed, one of the first things we did while working on this was to dump all of the colour values used by the VS2012 RC light & dark themes, as well as the default VS2010 theme, into spreadsheets so we could use them for testing without firing up a host instance of the IDE (developing add-ins may be fun, but it is also much slower than working on your own executable). Needless to say, all of this is proving to be a major task, and it has therefore diverted significant resources from other things we should really have been working on this summer. As a consolation, the theme code we're developing is generic (albeit only on Windows), so can also be used with Eclipse 4.0 (I note that themes are coming to that IDE as well) when the time comes. Another obvious benefit is of course that there's potentially at least one new CodeProject article (want a themed XP button with a custom background colour? We know how to do it now) in all of this once the dust settles and the inevitable bugs have crawled away. It's about time I wrote a new one, anyway. Well, it's done. After a rather extended incubation period ResOrg 2.0.0.15 (the first public ResOrg 2.0 build) was uploaded earlier this morning, and the ResOrg product pages updated to match. 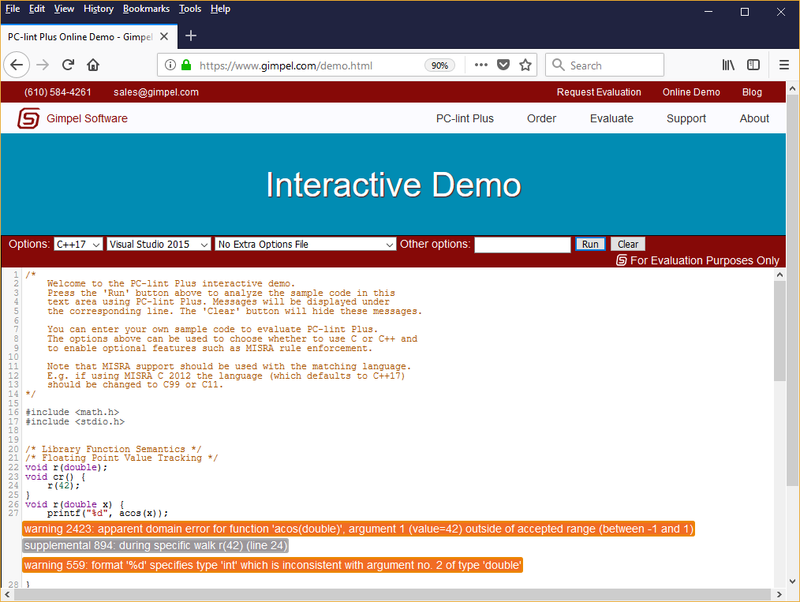 If you have used ResOrg 1.x before, you will notice that the user interface of ResOrg 2.0 is subtly different from its predecessor - notably in the Visual Studio plug-in (which now of course supports Visual Studio 2008 and 2010...). In particular, the old (and rather limited) "ResOrg.NET Explorer" toolwindow has been replaced by a much more useful "Symbol Files Display" which is also available in the standalone application. If you are using Visual Studio 2010, it might interest you to know that ResOrg 2.0 can automatically update Ribbon Designer (.mfcribbon-ms) files when an ID referenced in a ribbon resource is renumbered. I won't include any screenshots in this post as a couple of good ones were included in the previous post, however if you are reading this post in your RSS reader you can find them at https://www.riverblade.co/blog.php?archive=2011_12_01_archive.xml#2011121501.